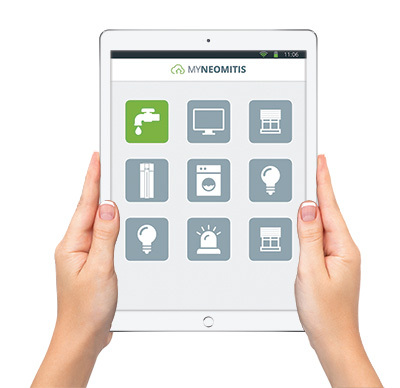 Whatever your profile, MYNEOMITIS is a single interface which self-adapts to meet your needs. A single revolutionnary interface ! + Rugged and designed to last. + Equipped with an OTA processor for the software remote update. + Optimization, monitoring and measurement of internal temperatures, safety and reliability. + Permanent backup of settings in case the mains power supply goes off. + PID controller: this means stable and accurate temperature all year round. + Setting-up assistant: configure the main settings in a few minutes. + User profile monitoring: home, hotel, offices, public building to adapt to each need. + Gauge and power consumption indication in kWh. + Opened window detection and manual activation of the ventilation cycle. 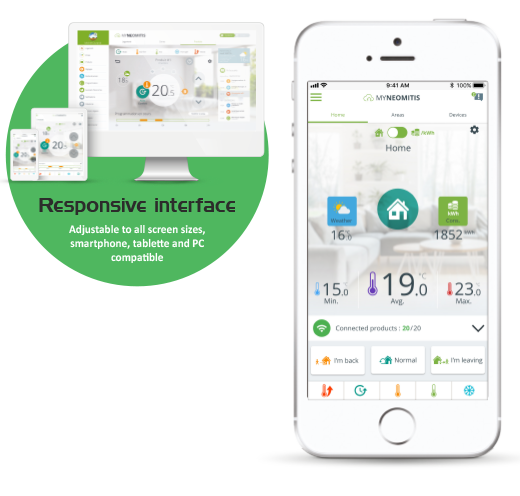 + Smart ambient temperature sensor adjustment with automatic compensation.